You only need 3 ingredients to make these delicious and easy homemade sugar free chocolate chips. They’re perfect in low carb and keto baking and a much cheaper alternative to store-bought low carb chocolate chips. From now on, I’ll always have a jar of homemade sugar free chocolate chips in the larder. And when I get one of these urges to make my favourite low carb chocolate chip cookies RIGHT NOW, I’m good to go! If a low carb recipe calls for sugar free chocolate chips, there are a few options. 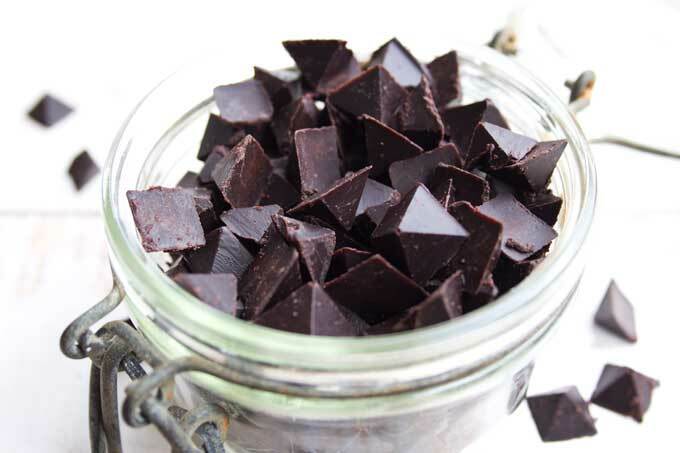 You could go for cacao nibs, or for unsweetened chocolate and simply break it into pieces. Or you can use a quality chocolate with a cocoa content of 90% such as Lindt. A whole bar of this chocolate (100g) clocks only 7 grams of sugar. It contains 10 squares, which makes it 0.7 grams of sugar per portion. Then there is stevia-sweetened sugar free chocolate such as Lily’s. Lily’s is popular in the US and sells chocolate bars as well as chocolate chips. The only issue is that low carb chocolate brands are EXPENSIVE! This is why it was time to post my own sugar free chocolate chips recipe. It’s so easy – check out my step by step tutorial below! 1.) 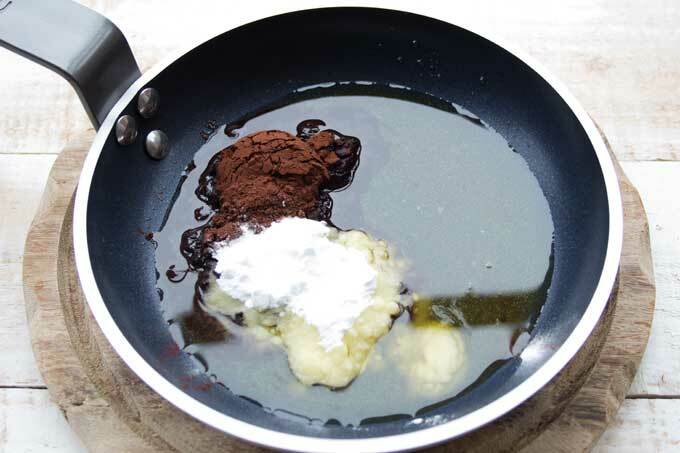 Get yourself a frying pan and some cacao butter. Cacao butter (also called cocoa butter) is the main ingredient of quality chocolate and has the benefit of being firm at room temperature. It is therefore a much better (and tastier) option for homemade chocolate chips than coconut oil, of which there are a few recipes online. I used this brand here in the UK. In the US you can go for this brand. 2.) Melt the cacao butter and add unsweetened cocoa powder and powdered sweetener. I prefer the taste of erythritol sweetener over stevia glycerite, but of course, stevia is an option here too. Stir until combined. Top Tip: If you wish, add 1/4 tsp of vanilla extract. 3.) 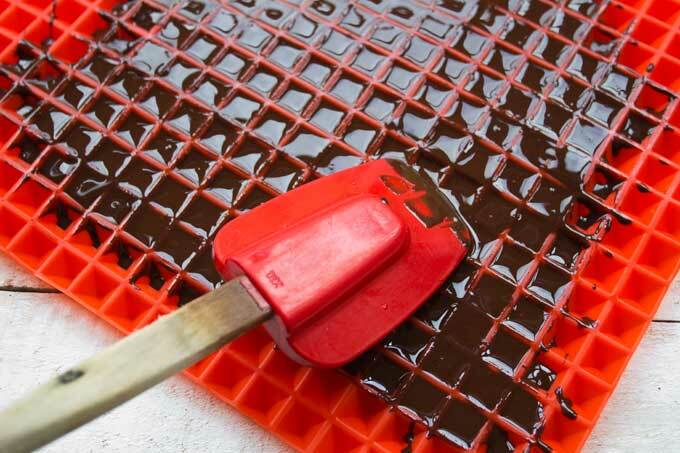 Pour the melted sugar free chocolate onto the underside of a pyramid silicone baking mat. These mats are actually sold for fat-free roasting – if you place meat on top of the pyramids, the fat can run off and your meat gets crisp and browned all round. 4.) 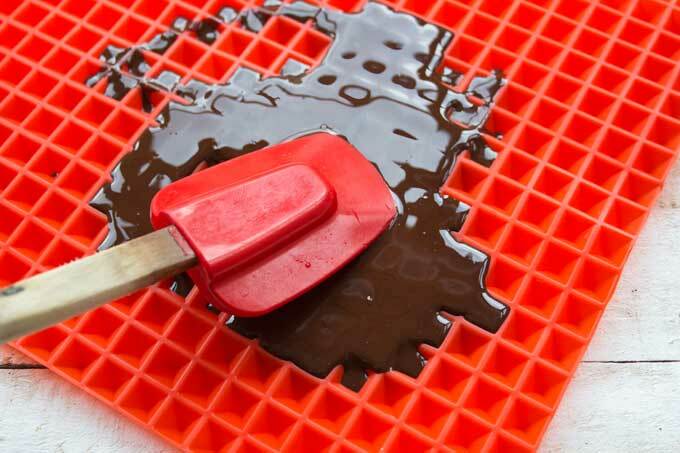 Using a spatula or a spoon, spread the chocolate evenly into the silicone mat and place it in the freezer for 5 minutes. 5.) Now release your cute little pyramid-shaped sugar free chocolate chips! They’re ready to use in your favourite low carb recipes. 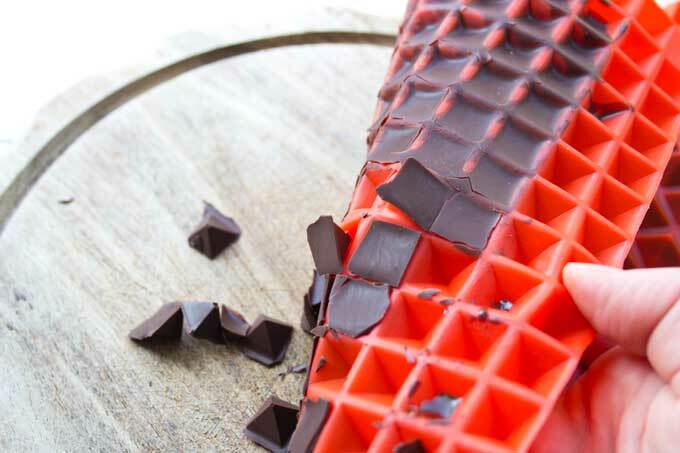 If you don’t have a pyramid silicone mat (or a silicone trivet), you could simply pour the sugar free chocolate onto a baking tray lined with parchment paper. After the chocolate has set, break it into pieces. If you want to go the full nine yards, check out this chocolate chip mould which you can get on Amazon US! It creates the perfect chocolate chip shape. 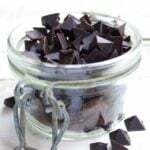 For an even simpler version of the recipe you could use 100% unsweetened chocolate and sweeten it with powdered erythritol. If you choose to do this, make sure you use quality chocolate such as Montezuma’s (my go-to brand in the UK). Cheap chocolate has a tendency to seize and curdle if it’s not heated VERY carefully. As mentioned above, I don’t recommend swapping the cacao butter for coconut oil or adding any other ingredients such as butter and cream. Your chocolate will not be firm at room temperature and you’ll have to store it in the fridge or freezer. Important! This recipe works best with powdered sweetener. Granular sweetener is too heavy and will sink to the bottom, resulting in crunchy chocolate chips. You can blend granulated sweetener in a food processor to make powdered sweetener. Want to find out more about cacao butter? Here is a great resource explaining why it’s actually a superfood. 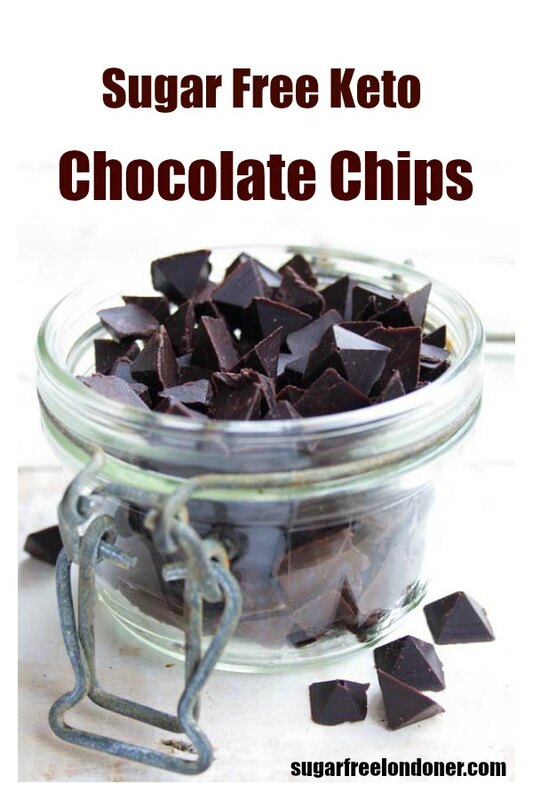 It's so easy and quick to make your own sugar free chocolate chips! Check out this simple step by step tutorial using only 3 ingredients... and a silicone baking mat. Melt the cacao butter in a pan. Add the cocoa powder and powdered sweetener and stir util combined. Add the vanilla extract, if using. Pour the melted chocolate into the underside of a pyramid silicone baking mat and place in the freezer for 5 minutes until set. 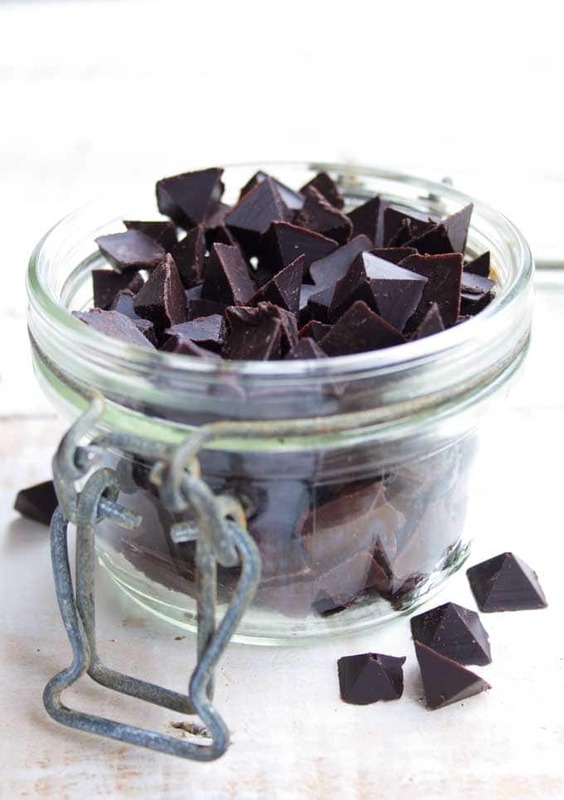 Release the sugar free chocolate chips from the mat and use in your favourite low carb recipes! 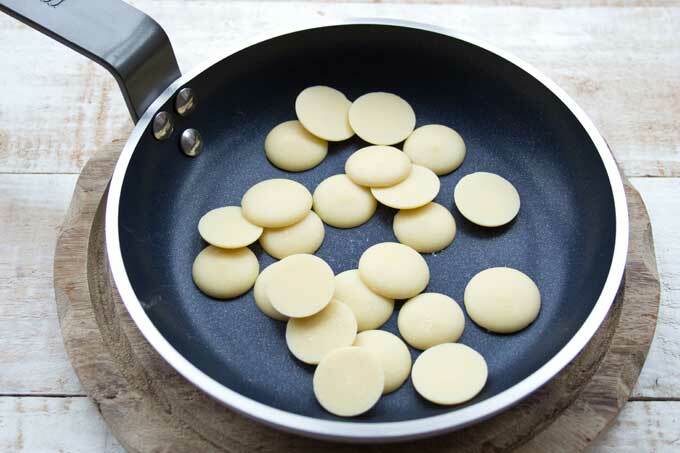 You can use any silicone trivet to make sugar free chocolate chips. If you want the classic chocolate chip shape, you can also buy this silicone mould (Amazon US only). If you don't have any mould but sill WANT chocolate chips, simply pour the melted chocolate onto parchment paper and let it set. Then break into small pieces. I calculated the nutrition on the basis of 10 portions. 1 portion = one tablespoon of chocolate chips = weight: around 7 grams each. Hi Michelle, here in the UK it’s available in normal supermarkets. Just look out for 100% cocoa powder. Otherwise, I’d check out your local health food shop or amazon. What can be used for white chocolate? Cant wait to try this with stevia. Question, can i use theee as chips for baking cookies or will they melt in tbe baking process? Just made a batch waiting for it to cool down. Just wondering if I could use this as a replacement for when a recipe calls for melted chocolate, say for example example brownies? Just.So. Good. Making a second batch right now. Brilliant!!! What will you make with them? You’re welcome Barbara! I actually think this recipe makes better chocolate than the sugar free chocolate brands you can buy. And like you say, you can save a ton of money at the same time. So easy and REALLY yum. I made chocolate bark with this recipe, which I broke into pieces. Perfect. That’s great! I’m glad you enjoy the chocolate. Isn’t it sooo creamy? ?